Tuner Tool. Required to tighten Tuner Style Lug Nuts. 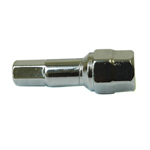 Fits 10mm and 12mm Tuner Style Lug Nuts. Copyright 2018 LL Dustman, Inc. All Rights Reserved. This includes ALL CONTENT and IMAGES.